Well, the first day of Fall has come and gone. It's really just a date in Hong Kong. If you're really paying attention, you might notice that the breeze feels a little cooler, or that you're not instantly sweating as you step outside. There have even been days that I felt like I could add a light layer! There is a trick to it here, you see. When I add a layer, I wear something lighter on the inside. Underneath this blazer, for example, I'm wearing a summer tank top. And, until the afternoon, I hadn't even felt too warm! Now that we're on our Fall break holiday from school, the weather is back to being scorching like summer. Sigh. But there are some key Fall favorites I'll be sure to pull out when I get more consistent cool weather. There are five I've styled in this outfit. Probably the first will be blazers. 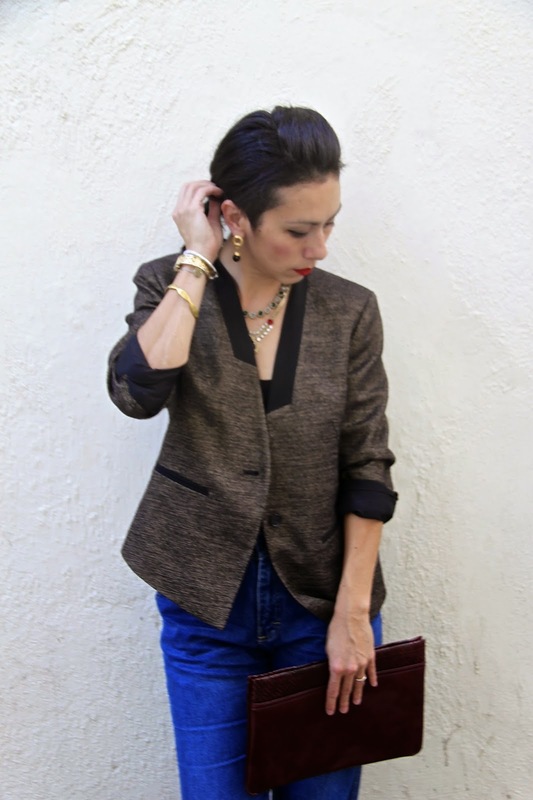 I have a huge collection of vintage blazers that I look forward to wearing. The one in this post is new from LOFT, which I picked up in Stanley Market. (Here is the same in a bomber jacket version). I liked the metallic threads woven through which gave it a tweed-like appearance and it's definitely a good Fall color. Given the blazer's shimmery quality, I decided to dress the rest of my outfit up with luxe details. Blingy jewellery is a fall favorite, for sure. Mine is a mix of vintage and modern, as always. Third is my burgundy (wine, oxblood, or whatever color they decide to call it this season) vintage leather clutch. There are so many to choose from at all your favorite retailers like Zara, H&M, Gap or Topshop, just have a look. Fourth, the high waisted jeans are a definite Fall go-to. Great for dressing casual or dressing up depending on the cut and the rinse. Finally, I love wearing my black oxford shoes (mine are Sam Edelman. Here is a nice pair with a buckle.). They look great with pants or dresses. And even later, with tights. Admittedly, I find most of my inspiration from vintage or thrifted pieces, but there are new pieces that can blend in nicely. If you're looking for some inspiration, and you have some favorite retailers in mind, you should consider visiting Raise.com. I always love a good bargain and on this website, you can buy discounted gift cards or sell yours. Really, it's just another way to recycle or reuse something, which always appeals to me. I think this will definitely be a good website to visit for Christmas gifts.